Creeping Charlie is enjoyable to rip out of the ground. If you grab the stems just right and before they have rooted too strongly, you end up with a large mass of spreading stems in your fist. Not so for purple deadnettle or henbit. They don’t really creep along the ground; they grow just high enough to flop down without rooting where they touch down. But grab their stem and they break off, leaving the roots and lower pieces of stem intact and ready to start growing again. 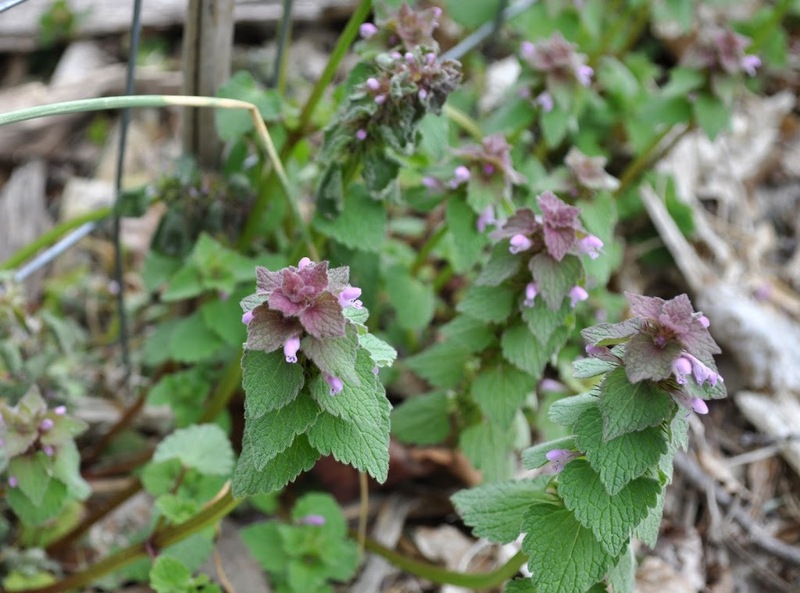 Creeping Charlie seems mostly to creep into garden areas at the edges. 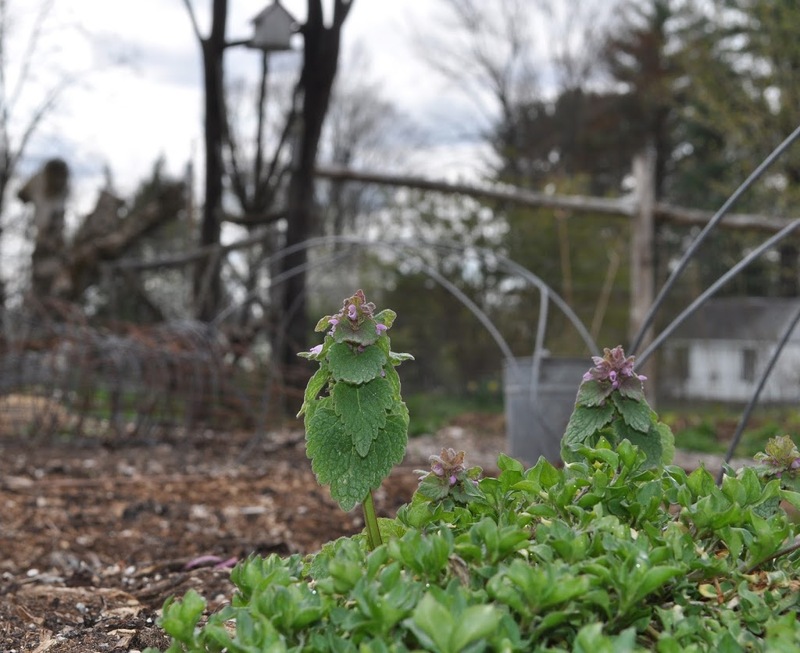 Purple deadnettle and henbit spread very effectively by seeds, so clumps of the plants appear suddenly in the middle of the garden. They’re also sly in sprouting very late in the season, after everything has been harvested and cleaned up, at a time when I feel that the garden no longer needs my undivided attention. As long as we’re on weeds, I’m getting reports of another weed, one that’s not in my garden but is turning up in hordes in some other gardens. The weed: maple. Yes, “maple,” as in maple trees, albeit 2 inch high maple trees — for now, at least. These seedlings are probably, and hopefully, sugar maples (Acer saccharum). Another possibility is Norway maple (A. platinoides), generally disdained for creating shade too dense to allow grass or anything else to grow, for encroaching on and crowding out sugar maples, and for having ho-hum or downright unpleasant autumn leaf color. Yet another possibility is striped maple (A. pennsylvanicum), so-called for the prominent white stripes on its greenish bark. The seedlings are unlikely to be those of either Norway or striped maple unless some trees of either are nearby. So what’s wrong with some sugar maple seedlings? Nothing, unless you don’t want maple trees there. The seedlings could be carefully transplanted to a more agreeable location. Or you could take a hoe, and hoe-hoe them out. With all the activity outdoors, it’s easy to overlook what might be happening, plantwise, indoors. Take, for instance, what looked like two stones sitting pressed together in a small flowerpot at one of my sunny windows. Those two stones have separated and another set of “stones” is pushing up through the widening cleft. 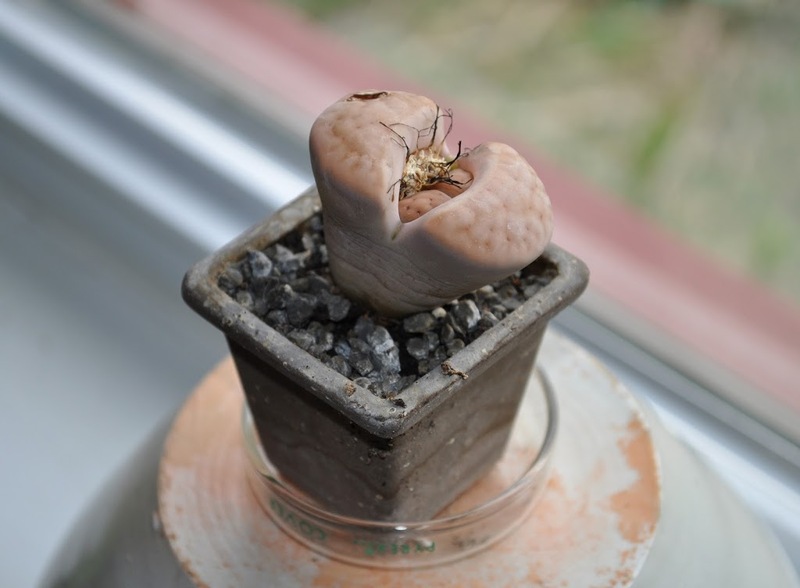 The plant is one of the appropriately called “living stones,” a translation of the genus name Lithops, which the plants are also called. The stone-like appearance of these plants — they also are gray in color — disguise them in their natural stony habitats in South Africa. Their cover is blown once a year when the plants flower. This entry was posted in Uncategorized and tagged Acer saccharum, creeping Charlie, deadnettle, Lamium, Lithops, living stones, sugar maple. Bookmark the permalink. Trackbacks are closed, but you can post a comment. Last week’s blog didn’t show up – could you repost? Done… thanks for the heads up.